Free Red Zone Bus Tours* for our weekend guests! Red Zone Tours have started so we booked online and headed along to see just what the fuss was about – is it worth paying $15 per person to see our own city. Our tour started just as the fog that had hidden the battered city centre since morning started to lift. While chilly on the bus till the end, the low cloud cover diffused the direct sunlight allowing a panoramic view on all sides of the bus uninterrupted by any dazzling sunlight. We arrived at the advised 10 minutes before departure only to find that all the higher seats at the back of the bus had already been taken. We sat in the middle belly section of the bus but still found the view to be fine. 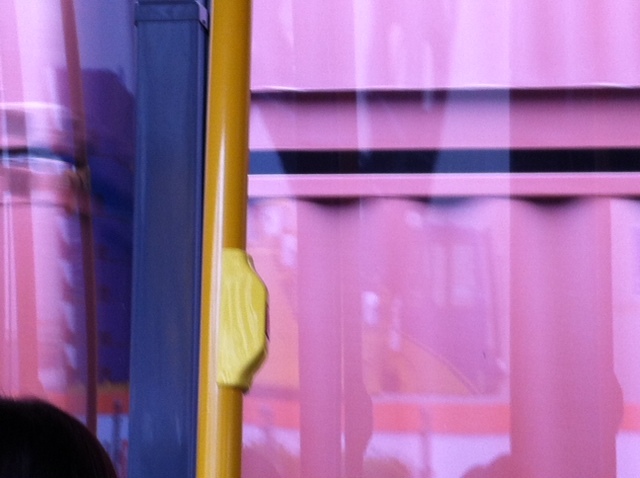 The bus was obviously the Red Bus Company’s newest addition - swank but the yellow swoosh window coverings at the front and back of the bus did obscure the view outside a bit. There was the obligatory safety talk about remaining seated and to follow the instructions of the staff in case an emergency evacuation was necessary. After going on the first Red Zone bus tour several months ago I knew they were realistic warnings as the bus was indeed to pass right beside many buildings that are on the demolition list. The commentary was a live presentation by a representative of the Canterbury Museum which added credence to the narrative. How participants appreciate the information will depend on just who they were. Myself, living just 1 block from the Red Zone barrier, and having seen a lot since the quakes really wanted more. More stories, more statistics, more anything….more than what I already knew. But for someone from the outer suburbs who had avoided the Central City area since the quakes or even a traveler from outside of Christchurch or even from overseas may have found the scenes from the bus windows and the commentary an absolutely mind boggling gooble of over information that left them numb at the end of the 40 minutes. There was a graphic presentation using past & present photos etc. playing on the screen at the front of the bus but the screen was a bit too small even from ½ way down the bus. But, I would also say that what with concentrating on the commentary and looking out the window I did not find myself looking at the screen too much so maybe it is just right the way it is. Our tour was 40 minutes long and of that we would have spent only about ½ in the actual Red Zone. But this did not subtract from the Tour and if anything gave an overview as areas of interest outside of the Red Zone were also introduced during the tour. 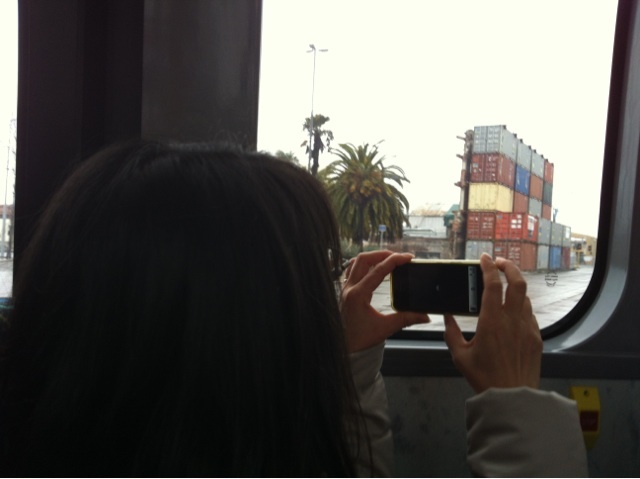 We even drove right past the Motel down Salisbury St. and photographed the next tour for effect! 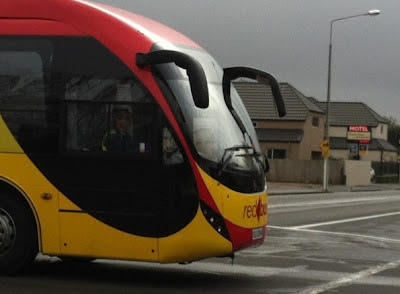 Some have dismissed these tours because most of the Red Zone can now be seen from outside the fence due to the various cordon reductions but taking the bus tour does allow close up and personal glimpses of parts of central Christchurch no-one without a Red Zone pass has seen with their own eyes for a very long time. It also allows a close up view of places we walked of right pre 22 Feb.
For the visitor from outside of Christchurch or outside of New Zealand, it gives them a chance to see what happened and is still happening in our everyday lives. 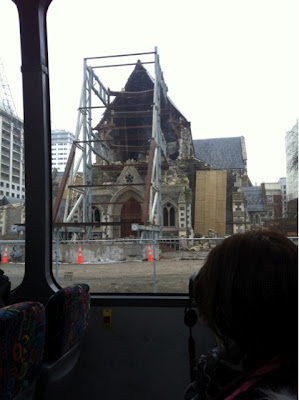 It helps them learn about Christchurch now and we need these people to take our story, Christchurch’s story back home with them so that the world can develop an understanding of what has happened to our beautiful city. 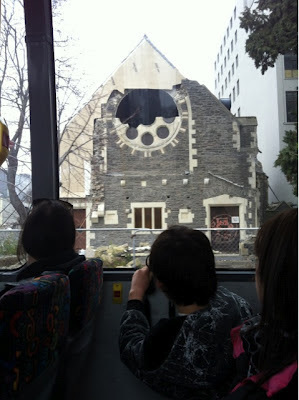 After the tour, we visited the Earthquake Exhibit in the Canterbury Museum which we thoroughly recommend to all visitors to Christchurch – especially those that choose to take the Red Zone Bus Tour. 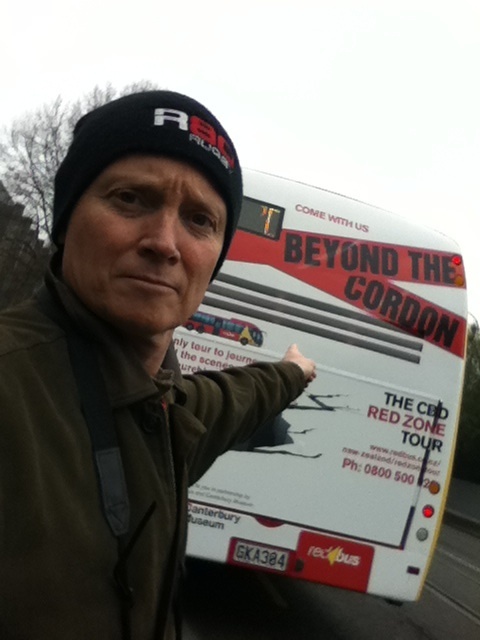 As mentioned in our previous blogs, we will be offering our Red Zone Bus Tour Special. 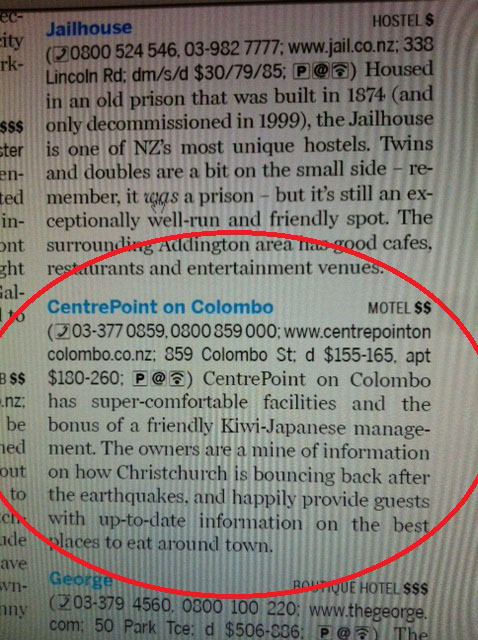 At CentrePoint on Colombo Motel, we will pay up to $10 each for up to 2 persons per room for direct reservation guests who stay with us on Fri, Sat or Sun nights until the end of August 2012 and take the Red Zone Bus Tour – and you get to stay just 1 block from the edge of the Red Zone northern boundary. *Subject to terms & conditions. We love working away here in the motel office while listening to MIKE YARDLEY’s CANTERBURY MORNING Monday to Thursday. Its fast paced, honest and Mike asks the hard questions when they need asking! One of today’s topics was “Essential Christchurch. 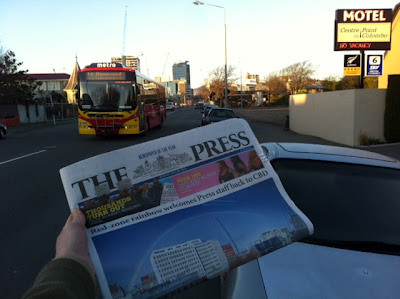 What are the 30 great things to see and do in Christchurch?” Lots of people rang in and talked mainly about local attractions but we thought there must be some “only now in Christchurch things” and came up with the quintessential list of 42 things everyone should do while here. Actually we came up with 41 things to do and Jeff's Aunty - a Residential Red Zoner - proposed the 42nd. thing to do which sits at 41 on the list. Every visitor should do all these things……. which CAN be done! Visit the site of the Cardboard Cathedral. Stand in front of Museum and pray it opens soon. Walk round the Red Zone. Support a business within 1 block of the Red Zone. Use the 2 hr. free City Council car park. Drink a coffee or beer in a Container! Listen to NewstalkZB morning show with Mike Yardley. Take a picture of a road cone. Get a picture of the biggest truck with “DEMOLITION” written on the side. Vote to save the Cathedral. Take a picture in front of the large RWC Cup in Hagley Park. Feed the ducks, and eels in the Gardens. Get great NZ cheese at Canterbury Cheesemongers. 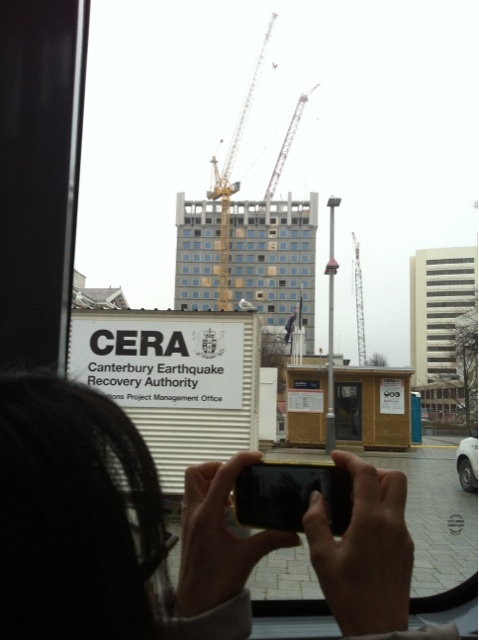 Buy an earthquake momento – postcard of demoed building, aftershock socks or T-shirt etc. Eat at a rebuilt restaurant. See the White Lights of Hope at night. Take a bus tour and see the city. Talk to a local about their earthquake experience. Try and work out who is the boss in Christchurch; Bob, Gerry Warwick or Roger. Go to a café in the day and a gay nightclub at night in the same building. 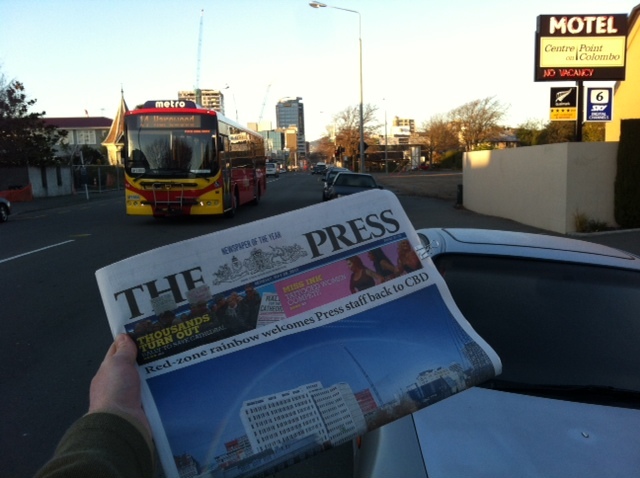 Take a picture in front of the HSBC building – the real seat of power in Christchurch. 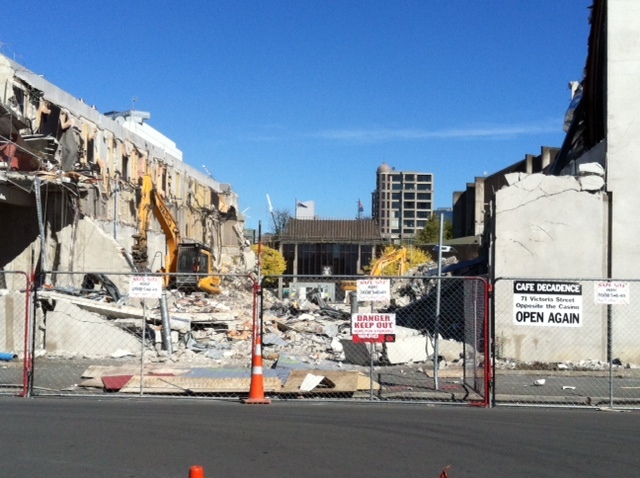 Look down Colombo St from Peterborough St to the remains of Cathedral Spire. Look down Worchester St from the river to see the remains of the Cathedral. Turn your GPS off & don’t eat while driving to safely navigate the Red Zone and road closures. Visit & experience a Gap Filler project. Say Hi to the Town Crier. Take 5 and enjoy and support a busker. Drive or bus out to Sumner. Go to Deans Bush & feel the history. Take time to walk through some of the residential red zone to gain an understanding of why people have to move. Yesterday we blogged about how we intend to offer Free Red Zone Bus Tours to our guests (see the finer details here). Today we emailed the details to NewstalkZB’s Mike Yardley and he covered what we are doing in a 2 minute special on air!! He also said he would keep an eye on what we were doing so we look forward to reporting what actually happens. Jeff then, by chance followed up by ringing into the Flash Reaction Poll and having a quick chat to Mike live on air about the proposal as well! Later in the afternoon Jeff did an over the phone interview which (maybe) will be used in radio news etc. tomorrow….tune in people, tune in! For us, this is a bit of PR we cannot buy for love nor money but we now have to deliver on the promise and know Mike will be watching us! But not only that, this is a continuation of our battle to get the word out that the city centre is still here!! We do our bit when we can and we are looking forward to this being a chance to once again promote the Christchurch City Centre and all the great things it still does have and we welcome the challenge. We are also proud that our social media efforts have been transcribed into real, on air time on mainstream media….not bad for a 12 room motel. 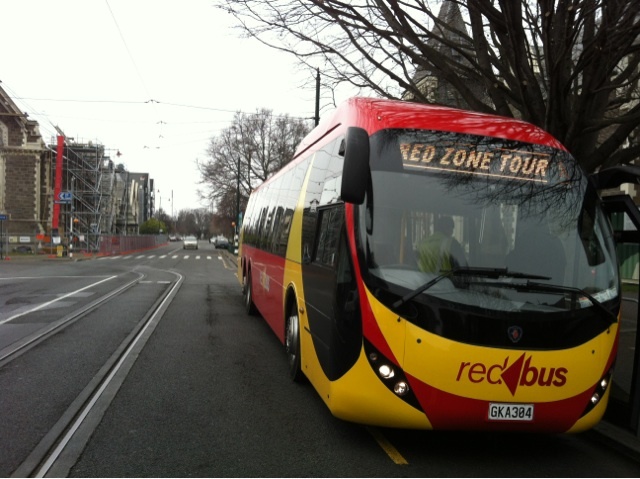 CERA has announced a new round of Red Zone bus tours. Bus companies have been asked to submit tenders and the tours may be operating as soon as May. We will make them free for weekend guests! We welcome this news and look forward to the start date being announced. We hope it will be a boost to the local economy as the peak season tourist dollar dwindles and we enter the quieter months of the year. An online poll in The Press overwhelmingly says locals don't want to pay to see their city centre but such negativity is probably more aimed at Cera’s control of the area people once freely walked. This time, people will be able to access this cordoned area and paying for the costs involved is reasonable. People will have a choice whether to take the tours or not after all. We believe the tour will appeal to visitors to Christchurch who want to find out about just what happened and why the barriers are still up so long after the main event. 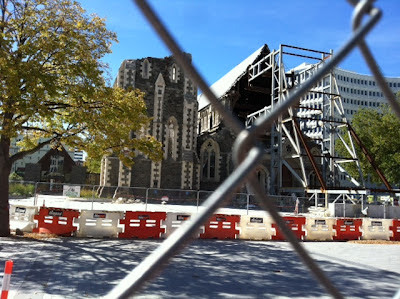 One recent visitor to Christchurch commented on our Facebook page “As a tourist there this time last year, I would have happily paid to A) get a sense of what was going on and B) put some money in the coffers for the rebuild (which was part of our reason for not cancelling our trip in Apr/May 2011!) 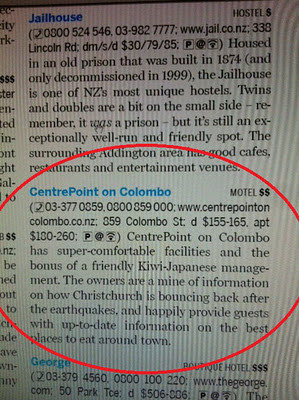 as we wanted to support the local economy in any way we could!” and we are sure other visitors to Christchurch will feel the same. At the estimated $10 per person this could be a great 1/2 day activity for visitors when combined with a visit to the museum to see the earthquake exhibit there. We’re sure a creative operator could quickly put together an inventive tour including hand outs and possibly even video explanations. We're obviously stuck with this Red Zone cordon for quite a few months to come so if this idea can entice people to Christchurch as we enter the quieter months of the tourist year it may well help some people pay some bills. If that's the case it gets a "like" from us! Bus tours, like last year will probably run on weekends, when deconstruction work is at a minimum and demand is there and this will tie in well with the weekend glut of accommodation which is already clearly visible. At CentrePoint on Colombo Motel, we will pay up to $10 each for up to 2 persons per room for direct reservations guests who stay with us on Fri, Sat or Sun nights until the end of August and take the Red Zone Bus Tour – YES! it’s free when you stay with us and you get to stay just 1 block from the edge of the Red Zone northern boundary. *Subject to terms & conditions.